I am very excited to introduce today's guest, who writes scary and suspenseful books with a touch of romance. Welcome Melanie Atkins! Melanie Atkins, author of killer romance and suspense! I have a new free author app for iPads and iPhones up in the iTunes store! I'm really excited about this. Search "Melanie Atkins" to find it. Also, Deliverance from Evil, the fourth book in my Keller County Cops series, will come out June 1 at Desert Breeze Publishing. No. Except I would have written it faster. I had too many distractions and kept getting sidetracked. They say there's an app for everything, and there's now an app for you. Would you tell us a little about that? Yes. I met Frank Danna from Onseeker Technologies at the Romantic Times Convention in Chicago in April and signed up with that company to develop an author app. With it, readers can pull up a list of all of my books complete with all prices and sales venues, blurbs, and excerpts. They can also connect with me via Twitter and Facebook straight from the app and access my blog feed. In addition, I can input any book signings and appearances to let them know where I'll be. What a great way to connect with people! You blog about Castle (the TV show) - how did that come about? I met Lee Lofland when he was an instructor at Forensic University in St. Louis in 2007 and have been using him as a resource for law enforcement info ever since. I've also attended his Writers' Police Academy for the past two years. He found out I'm a big Castle fan and asked me last year to blog about the relationship (romance) part of the show, while he critiques the police procedure. It's been fun. Lately, we've had a good cop-bad cop thing going on. I don't know that I have one favorite, but I do love Lisa Gardner, John Sanford, Karen Rose, Tess Gerritsen, and Robin Perrini. All write great suspense and/or thrillers, my favorite types of books. Not really. I've always read, beginning when I was just a kid. My mom would take me to the library every week and let me check out stacks of books. We lived in a small town with a tiny library, and before long we had to order books from another library. I read everything I could get my hands on. They like it. My mother has read all of the books I have in print. She's 90 and doesn't understand ebooks, although I think she'd like them if given the chance. Once she has cataract surgery and can see better, I plan to introduce her to my Kindle Fire. Not an object, per se, but I love to write outside on my deck. I have less distractions out there and enjoy writing while listening to birds chirping with my cats sprawled out under my chair. Great creative mojo. 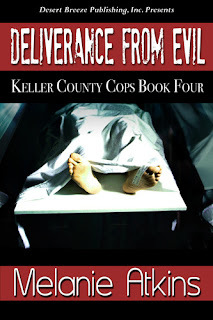 Deliverance from Evil will be out June 1. In this story, Tessa Doucet chose to go into mortuary science because the dead can't hurt her. Then a monster from her past turns up on her embalming table, and she's forced to confront the demon she thought she'd put to rest. Puzzled by the case Tessa stirs up, Detective Cash Starkey finds himself falling for her, even though he swore to keep his distance. He doesn't want a relationship, especially not with a woman running from her past. Yet when Tessa's life is threatened, he runs into the fray, and together they defeat her demons and put the past behind them. I enjoyed watching Tessa and Cash's story unfold. They had trouble learning to trust one another, but once they did their bond grew strong. Their relationship took a turn I didn't expect, but I love how it all worked out. I know their backgrounds before I start writing, but often learn their secrets as the stories unfold. Not whole personalities, but I do use little quirks and oddities I spot in people I meet. You've heard the old adage: Be careful what you do, because you might end up in my novel. That's true! Nick Marconi from Blood Rite, my March 2012 from Whiskey Creek Press, is my favorite character so far. And no, he's not modeled after anyone. He came straight out of my head. I wrote that book in six weeks. I don't know where it came from. I love writing action scenes the most. I feel an urgency to get the words down. I have to type fast to keep up with the words flowing from my brain. When my characters start to talk, I have to write. And quickly. Finding enough time to write without distractions. Sometimes, life gets in the way. I've done a fair amount of traveling and really loved New York City, the energy and complexity of the place, and I also love the Caymen Islands and London, England. Let's just say I love to see and explore new places of all kinds. I'd love to go back to those places and also explore more of the world, mainly Italy, Greece, Spain, Portugal, and Brazil. One day, I hope to visit all of those places. Tessa Doucet chose to go into mortuary science because the dead can't hurt her. Then a monster from her past turns up on her embalming table, and she's forced to confront the demon she thought she'd put to rest. Flummoxed by the case Tessa stirs up, Detective Cash Starkey finds himself falling for her, even though he swore to keep his distance. He doesn't want a relationship, especially not with a woman running from her past. Yet when Tessa's life is threatened, he runs into the fray, not away from it, and together they defeat her demons and put the past behind them. Amazing, interview, Melanie. I love reading about you. I always learn something about your personally that I didn't know, and.... professionally. How cool about that ap. You are a natural born networker. Well done! Thanks, Donnell! And thanks, Maria, for hosting me today. Melanie, I'm honored to have you! I agree with Donnell. This was an amazing interview. And I love cuddling up with your books at night, although they rarely let me go to sleep without finishing them!! Thanks, Liz! I love your books, too. Can't wait for the next one.